What can the Paris Commune offer to present struggles for emancipation? 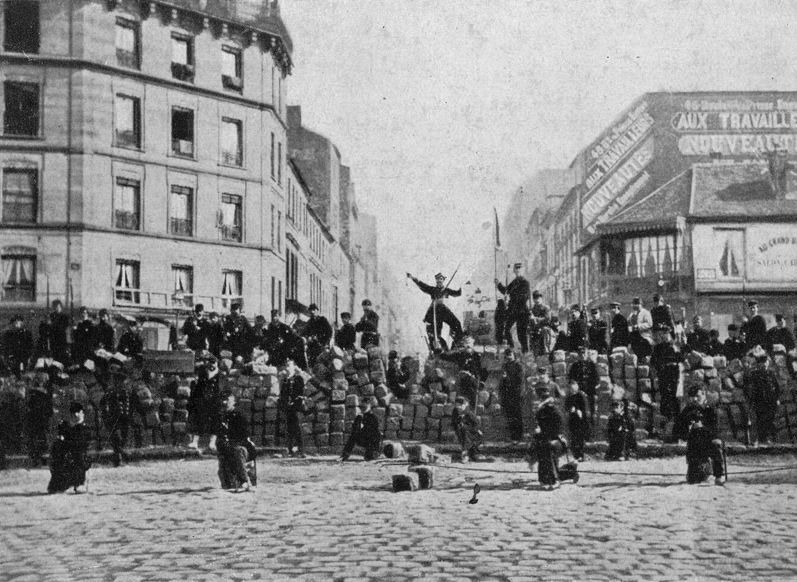 Communard at the barricades during the Paris Commune. On March 18, 1871, artisans and communists, laborers and anarchists, took over the city of Paris and established the Commune. That radical experiment in socialist self-government lasted seventy-two days, before being crushed in a brutal massacre that established France’s Third Republic. But socialists, anarchists, and Marxists have been debating its meaning ever since. Kristin Ross, in her powerful new book, Communal Luxury: The Political Imaginary of the Paris Commune, clear-cuts the accumulated polemics regarding the Commune, which she says have calcified into false polarities: anarchism versus Marxism, peasant versus worker, Jacobin revolutionary terror versus anarcho-syndicalism, and so on. This book restages the Paris Commune for our own time. Why is the Commune a resource for thinking the demands of our present? I am happy that you chose the word “resource” rather than the word “lesson.” Usually people insist that the past provide us with lessons or that it teach us what mistakes to avoid. The literature surrounding the Commune is filled with second-guessing, back-seat driving, and a delight in the listing of errors: if only the Communards had done this or that, taken the money from the bank, marched on Versailles, made peace with Versailles, been better organized. Then they might have succeeded! To my mind, this kind of after-the-fact theoretical superiority is both inane and profoundly ahistorical. Our world is not the world of the Communards. Once we have truly understood that this is the case, it becomes easier to see the ways in which their world is, in fact, very close to ours — closer, perhaps, than is the world of our parents. Its forms of political invention have become newly available to us not as lessons but as resources, or as what Andrew Ross, speaking about my book, called “a useable archive.” The Commune becomes the figure for a history, and perhaps of a future, different from the course taken by capitalist modernization, on the one hand, and utilitarian state socialism, on the other. This is a project that I think many people today share, and the Communal imaginary is central to that project. For this reason I’ve tried in the book to think about the Commune as both behind us, as belonging to the past, and as a kind of opening up, in the midst of our current struggles, of the field of possible futures. “Communal luxury” was a motto of the artists’ section of the commune and the title of your work. Could you tell us about the genesis of this phrase? Unlike “the universal republic,” “communal luxury” was not a resounding slogan of the Commune. I found the phrase tucked away in the final sentence of the manifesto artists and artisans produced under the Commune as they were organizing themselves into a federation. For me it became a kind of prism through which to refract a number of key inventions and ideas of the Commune. The author of the phrase, decorative artist Eugène Pottier, is better known to us today as the author of another text, the Internationale, composed at the end of the Bloody Week before the blood of the massacres had dried. What he and the other artists meant by “communal luxury” was something like a program in “public beauty”: the enhancement of villages and towns, the right of every person to live and work in a pleasing environment. This may seem like a small, even a “decorative,” demand. But it actually entails not only a complete reconfiguration of our relation to art, but to labor, social relations, nature. and the lived environment as well. It means a full mobilization of the two watchwords of the Commune: decentralization and participation. It means art and beauty deprivatized, fully integrated into everyday life, and not hidden away in private salons or centralized into obscene nationalistic monumentality. A society’s aesthetic resources and accomplishments would not, as the Communards made clear in act, take the shape of what William Morris called “that base piece of Napoleonic upholstery,” the Vendôme Column. In the afterlife of the Commune, in the work of Reclus, Morris, and others, I show how the demand that art and beauty flourish in everyday life contained the outlines of a set of ideas that today we would call “ecological,” and that can be traced in Morris’s “critical notion of beauty,” for example, or Kropotkin’s insistence on the importance of regional self-sufficiency. At its most speculative reaches, “communal luxury” implies a set of criteria or system of valuation other than the one supplied by the market for deciding what a society values, what it counts as precious. Nature is valued not as a stockpile of resources but as an end in itself. Your book extends the life of the Commune to the work of Kropotkin and the British socialist William Morris, among others. It is very easy to become entranced, in a horrified way, by what Flaubert called the “gothicity” of the Commune, by which I can only hope he meant the unmitigated horrors of the Bloody Week and the massacres of thousands that brought it to an end. I in no way minimize the significance of the massacre — indeed, I view that extraordinary attempt on the part of the state to exterminate one by one and en bloc its class enemy to be the foundational act of the Third Republic. I describe how the shockwave of the Commune as event, as well as the discussions and sociability that ensued with its survivors, changed the method of these thinkers, the issues they addressed, the materials they selected, the intellectual and political landscape they mapped for themselves — in short, their path. These immediate aftershocks are a continuation of the struggle by other means. They are part of the excess of an event, and are every bit as vital to an event’s logic as the initial actions in the streets. The thought and theory of a movement is unleashed only with and after the movement itself. Actions create dreams, and not the reverse. Peter Kropotkin, Elise Reclus, and William Morris were, you argue, preoccupied with marshaling together the “energies of the outmoded” associated with pre-capitalist and non-capitalist forms with the radical potential of emergent practices. Not only Kropotkin, Reclus, and Morris, but Marx too was preoccupied by the “anachronistic” existence in their own time of pre-capitalist forms and ways of life. The fate of the obshchina, those Russian agrarian communistic forms that had endured for centuries, was a major focus of western socialists. The theoretical challenge that took shape after the Commune revolved around the question of a revitalized commune-form: how to think together the astonishing insurrection that had occurred in a major European capital with the persistence of these older communist forms in the countryside. These thinkers were all extremely attentive to what we might call “wrinkles in time” — moments when the seamlessness of capitalist modernity appears to crack open like an egg. Historians in general fear anachronism as the greatest possible error. They are given to dismissing Morris’s interest in the Iceland of his day and its medieval past, for example, as wooly-headed nostalgia. Morris was in fact perfectly capable of seeing pre-capitalist forms and ways of life like those that had flourished in medieval Iceland as at once gone, past, part of history and, at the same time, as the figuration of a possible future. This is the mark, to my mind, not of nostalgia, but of a profoundly historicizing way of thinking. Without it we have no way of thinking the possibility of change, or of living the present as something contingent and open-ended. Kristin Ross is a professor of comparative literature at New York University and the author of Communal Luxury: The Political Imaginary of the Paris Commune . Manu Goswami is an associate professor of history at New York University.